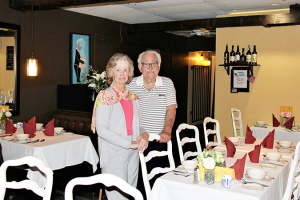 Frank and Karen Machado opened the Elegant Bull restaurant in Delhi in 1989. When Frank and Karen Machado opened the Elegant Bull restaurant in Delhi in 1989, many said it was crazy for the former Bay Area restaurateurs to chase success in the Central Valley. It’s been nearly three decades since then, and today, the Machados laugh in the faces of their naysayers as the Elegant Bull celebrates its 30th year of business. After 25 years of experience in the Bay Area restaurant industry, Frank initially planned to return to his hometown of Hilmar for at least one year to reconnect with family, retire and tend to livestock. Farm life proved to be a little mundane for the seasoned businessman, however, so when a little restaurant went up for sale in Delhi, he jumped on the opportunity. Frank has had a lengthy career in the restaurant business – his first place was a pizza parlor in Santa Clara, and from there he went on to find success in the fine dining industry, having learned the tricks of the trade by hand in the kitchen amongst a handful of Bay Area chefs. Elegant Bull allowed him to once again tap into that culinary expertise, with a menu that offers favorites like BBQ pork ribs, scallops Alfonso and New York steak. To celebrate the restaurant’s 30th year, Elegant Bull is offering special pricing on their New York steak dinner for two through Jan. 18. The Elegant Bull often gives back to the community it helps serve, added Frank. The Hilmar High School varsity football team will be on the receiving end of the restaurant’s generosity on Jan. 22, when they will be served a steak dinner in celebration of their recent section championship. Frank and Karen are postponing retirement for now, and at 86 years old, staying at home all day instead of working doesn’t sound too appealing — yet.